Home > billing > Why Won’t My Lawyer Call Me Back? The title above was a question posed by someone on my Linked In Family Law Marketing group. I tried to give a concise response, but it turned into this article. If your lawyer has not developed a effective way to keep lines of communication with you, perhaps you have the wrong lawyer. 1. 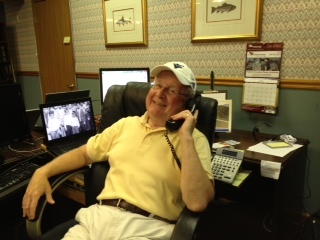 I am in the office by 7:00 a.m., at least an hour before my staff, and clients are told they may call me then. 2. I have a staff of five people, who average 10+ years experience. They know what they can say to clients. I urge them and clients to pass messages through them, and not be too upset if they do not hear my voice. 3. I try to give them a meaningful, useful, answer, whether is is my anxious personal injury for family law client. 4. I publish my home number, and give it to my clients. Believe it or not, they hardly ever call me at home; perhaps one call a week. That’s because I am accessible. 5. I am a fanatic about my answering my e-mail. I have iPhone 4s, iPad, Laptop, Desktop. I am CONNECTED!. 6. I insist clients write with concise questions. If they send a book, I refer them to my blog articles on how to communicate with their attorney, and we with the judge. It is essential that client concerns be summarized to concise numbered items. (Judges are too busy for us to follow rambling narratives. 7. I write two blogs; “Perspectives of a Small Town Lawyer”, www.burtonhunteresq.blogspot.com and “WV Lawyer – Tips and Techniques”, www.burtonhunteresq2.blogspot.com. Often I give them assigned reading so many questions are answered in advance. 8. I have published a book to Amazon Kindle, and I encourage my clients to read it. It is “Perspectives of a Small Town Lawyer” by J. Burton Hunter III and Nancy Lynne Hunter. 9. I utilize 40 years of practice to communicate effectively and to convince the client if she/he gives me accurate facts, I will dispense excellent advice. 10. As you can see, I am exceptionally handsome, which helps to keep my clients patient and undemanding, just like yours. And, actually, I am talking with my broker in the above photo.